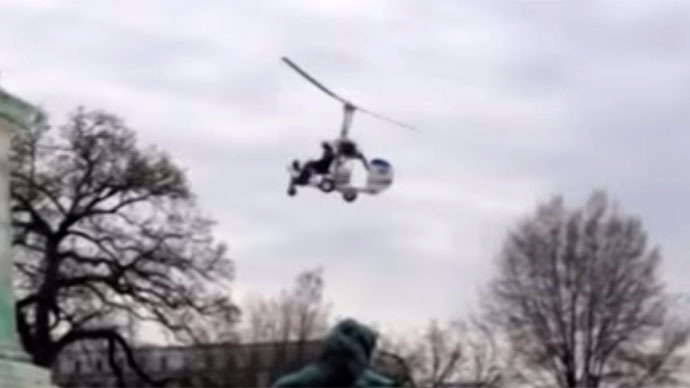 Officials say that the light-weight gyrocopter that landed on the west lawn of the United States Capitol Building earlier this month was detected by radar, but that technology rendered the aircraft indistinguishable from birds and balloons. The US House Oversight and Government Reform Committee grilled law enforcement officials from the greater Washington, DC area during a hearing on Wednesday concerning the incident two weeks earlier in which a Florida man landed a lightweight gyrocopter on the National Mall. Rep. Jason Chaffetz (R-Utah), the chair of the committee, told witnesses at the hearing that he has serious concerns about a communication breakdown that is being blamed for the lack of coordination that occurred on the afternoon of April 15 when 61-year-old Doug Hughes touched down on Capitol property in his personal aircraft. It has subsequently been revealed that federal authorities had become aware of Hughes’ plan to land a gyrocopter in DC a year-and-a-half ago, and that a Tampa Bay Times reporter had reached out to officials on the matter around 24 minutes before the pilot was apprehended. Nevertheless, law enforcement on the ground in Washington was forced to scramble to assess the situation only seconds before it was resolved peacefully. “At this point ignorance is no longer an excuse when it comes to drone and small aircraft,” Chaffetz said, echoing concerns from others in Washington who are still reeling from an incident earlier this year in which a hobbyist unmanned aerial vehicle, or drone, landed near the White House. “This is a question of technology and policy, both of which are rapidly evolving,” Rep. Elijah Cummings (D-Maryland) acknowledged at the hearing. At the same time, though, Cummings, a ranking member of the panel, said that the government’s inability to stay on pace could pose a problem if changes aren’t made. “I have come here to beg you to do whatever you have to do to get the technology if we don’t have it [and] to speed up the technology if it’s in the process to more effectively and efficiently allow you to do the jobs that you were sworn to do,” Cummings told the witnesses. Gortney and Clancy were flanked on the floor of the Capitol by fellow witnesses from the ranks of the US Federal Aviation Administration, US Park Police, US Capitol Police and the Pentagon, as well as the House’s sergeant at arms, who testified that he has since ordered law enforcement on the Capitol grounds to utilize the House Notification System to more quickly provide updates in the event of future incidents. Michael Huerta, the administrator of the FAA, admitted that the agency learned after the fact that its own radar systems had detected the gyrocopter, but said that, like NORAD, it appeared to be minor. The gyrocopter had appeared on radar as a “small, unidentified” dot, Huerta said, and “all available information about the slow moving, irregular symbol made it indistinguishable from other non-aircraft radar tracks,” including those made by birds and other small airborne objects. “Along with our interagency partners, we are engaged in a detailed review of the event and subsequent actions and responses to determine lessons learned and ways to improve our response moving forward,” Gortney testified. Hughes as charged with operating an unregistered aircraft and violating restricted airspace. He is free on bond ahead of a hearing scheduled for May 8 back in DC.